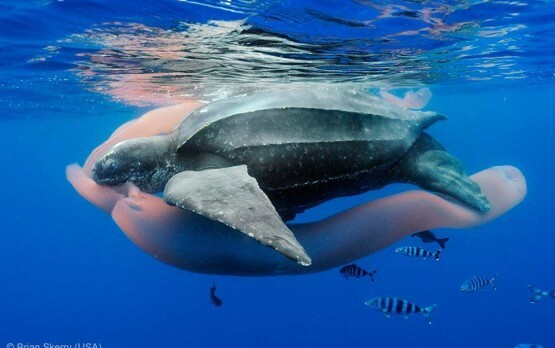 The leatherback sea turtle is easily separated from the other six hard-shell species as it is easily the largest and lacks the ridged body armor of its relatives. 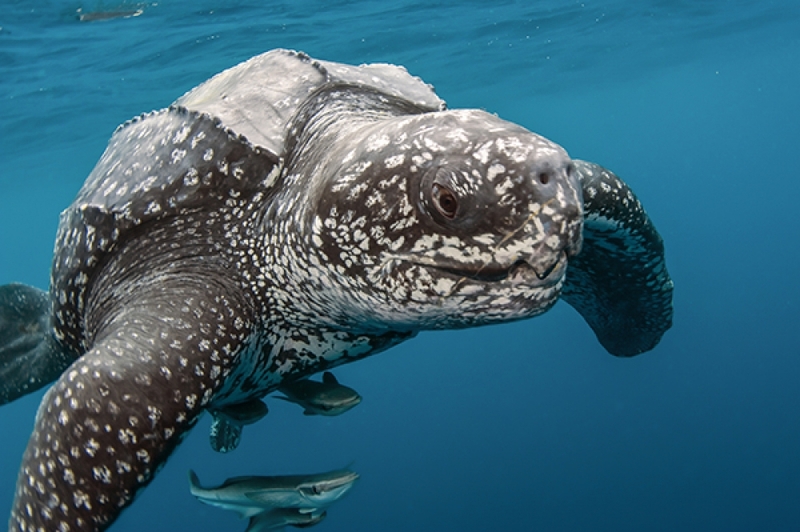 Instead it is covered in a leathery skin, were its cousins have hexagonal scutes the leatherback has pronounced ridges running the length of its body. A decent of the ancient giant sea turtle, Arcehlon, leatherbacks have remained practically unchanged for over 20 million years. Their flexible carapace is the reason leatherbacks are unmatched divers. Though they spend most of their time within the top 300 meters of the ocean these animals are able to descend as deep as 3,280 ft using a combination of adaptations. Leatherbacks have large onboard stores of oxygen in their blood and muscle and special features like collapsible lungs (to avoid ‘the bends’), a pulmonary sphincter (to shunt blood flow away from the collapsed lungs and back to the body during dives),and the ability to slow their heart rate in order to conserve energy and oxygen stores. Leatherbacks have the largest distribution of the seven species as migratory tracking has even placed them in the arctic waters near the poles. The have been known to grow as long as 10 feet weigh in well over 2,000 pounds. They mate every 2-3 years, nesting up to 12 times in a season laying clutches of 80 eggs separated by 30 smaller unfertilized spacer eggs. Their diet consists mainly of jellies. Their beak is soft and delicate while the throat is lined with papillae (small downward-angles protrusions) to keep the jellies moving!